That’s Great, all right! … Wow! … a Diva performance from the tank-turret! Camera motion/view angles are awesome, the music sounds great when Loud… and that model/motion doesn’t disappoint… Thanks for sharing! How did you get inspired to create it?… the trigger that kept you going? These two questions are worth answering and that’s what this article is about. A little while back, a great MMD video maker and friend of mine, Garmus1 (Daniel Clem on YouTube) sent me a link to view one of his videos. It featured a motion made by NephaShine which made use of a modern version of a 1960s Rock Classic: Paint It Black. It is a very nice motion, but it felt, to me, kind of flat. For me and Garmus1; we both felt that the lyrics of the song had a different meaning which was not touched upon in the interpretation of this song as expressed in the motion. There is nothing wrong with this interpretation! So, what’s the problem? Actually, none unless you look more closely into the history of this piece of music. Paint It Black was written and originally performed by the famous rock and roll group: The Rolling Stones. It was written around 1966 at the height of the Vietnam War. The original meaning of the lyrics probably had nothing to do with the war. Rather, it was more likely about depression or a bad “acid trip“. In this light, the MMD motion does a good job of capturing this interpretation. The version of this song used in the MMD video is a clip from the performance by Ciara, which was performed for a movie called “The Last Witch Hunter (2015)”. It is a beautiful performance and understandably highly popular. But it was not the first time this song was used in a movie. The song was first used in the classic Vietnam War movie “Apocalypse Now (1979)”; and because of this, the song was forever associated by the generation around that time (including myself) with the Vietnam War. One of the reasons why is because the lyrics perfectly captures the insanity of (that) war and one of it’s more tragic consequences: PTSD. PTSD or Post-Traumatic Stress Disorder affects a lot of soldiers who have faced combat situations. It is a disorder that the medical profession was not able to properly identify until more recent times, but now that its symptoms are understood, historians have found evidence for it dating back to the US Civil War and even earlier. Very crudely, PTSD has some similar traits to depression. 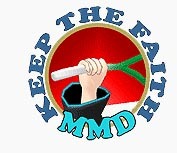 These traits are captured by the MMD motion’s interpretation, albeit in a highly stylized form. But I wanted to use this piece of music to portray those traits and the anti-war sentiments since associated with the lyrics. Now honestly, I was thinking of redoing the motion from scratch, but time constraints and other factors precluded that option. So I looked at the motion more carefully and then decided to slightly edit it to make it work for what I had in mind. In the final analysis, MMD video making is about interpreting a performance in video form. 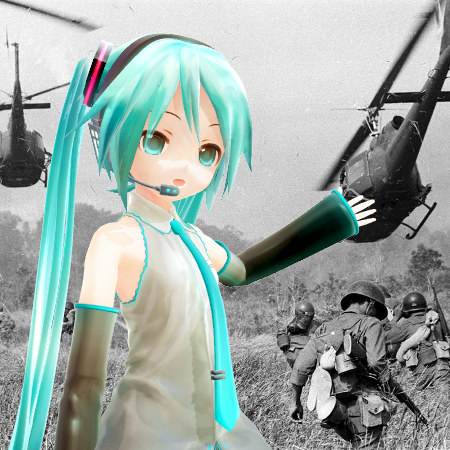 No two people will interpret a song’s lyrics in absolutely the same way, likewise, no two MMD video makers are likely to make the same identical rendition of a motion performance. 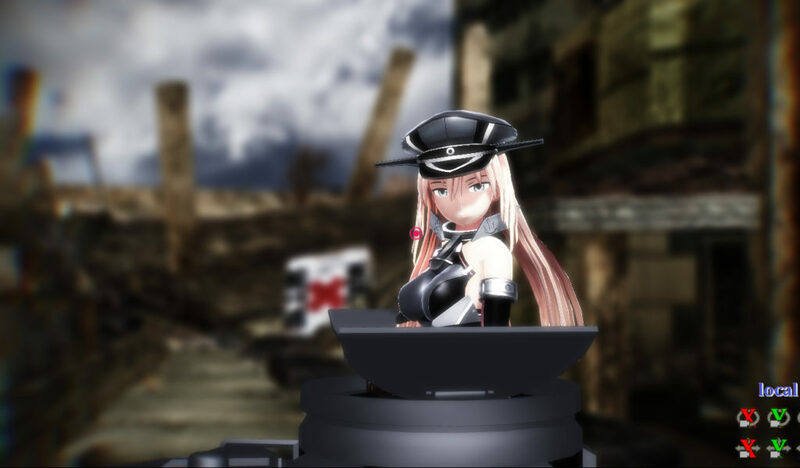 The problem, however, when using “canned” motion and especially camera motions, is that they tend to make many MMD videos featuring the same motion to look similar. For certain, though, the “Paint It Black” motion as issued did not work for my intentions nor with my model choices. Anyway, without further ado, here is the version of the video that I made linked below for you to check out. If you want to know more about the “nuts and bolts” as to the technical considerations that went into the making of the video, please continue to read the section under this video. A sky-dome – this item was attached to a dummy bone and actually rotates 30 degrees throughout the entire length of the performance. Most likely this isn’t even consciously noticeable, but it does help make the sky come “alive”. The ruined city scene. This was moved to where I wanted it for the scene. The Pz IV ausf D tank was located in a hull down position. This is actually Miho’s tank from the Girls N’Panzer anime series. The model is accurate, but suffers from being too clean and flat. Additionally, it is graced with lackluster material specifications which makes it a challenge to shade. Still, it is a nice model of the type and the early WW2 dark gray color scheme gives it a dark, slightly sinister and moody feel which works great for the ideas I am trying to convey. Bismarck Drei from the Kantai Collection battleship game franchise. I just plain like her and she makes a great WW2 era German tank commander; especially since she’s got a complimentary color uniform to the tank and without any politically problematic symbols on her attire. However, the motion was made for a Tda base model. In fact, in the original motion, the performer is seated on a chair provided for the purpose. Due to differences in Fraulein Bismarck’s bone structure, she wouldn’t be able to sit in the chair without modifying the poses. Since she was going into the tank commander’s turret anyway, I just made her stand. I also took out some of the motion’s more extreme eye and head movements as well as it didn’t work for the style of video I was trying to make. As issued, the motion’s facial expressions already does a pretty good job with giving Fraulein Bismarck a somewhat crazed/stressed look anyway, so I used that as issued. 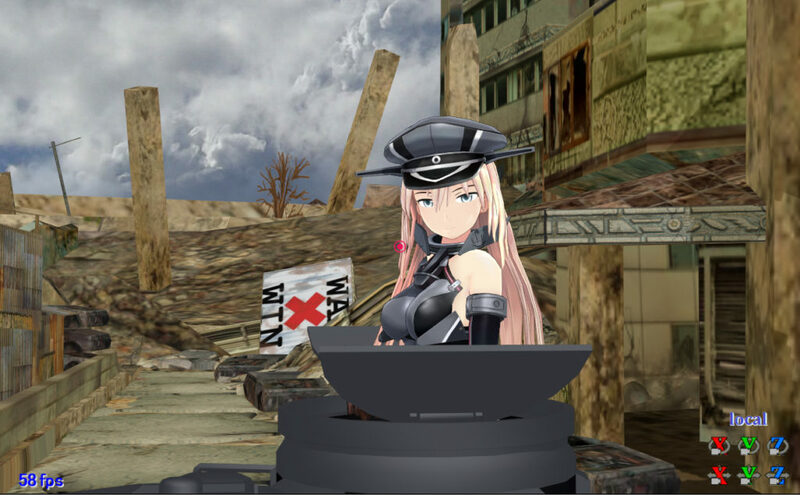 To ensure that Fraulein Bismarck moves correctly when the turret rotates, all that was necessary was to slave her mother bone to the tank’s turret bone using the Outer Parent function. Once this is set, it doesn’t matter what the tank or Fraulein Bismarck are doing, the two will move together correctly. The Outer Parent function was used to bind Bismarck to the turret control bone of the Pz IV tank. This ensures that no matter which way the turret turns (or how the tank moves), Bismarck will follow correctly . To maintain viewer focus and attention throughout the entire length of the video. To emphasize or integrate with the lyrics of the song. To be artistically pleasing at all times and cinematic where appropriate. Truthfully, I pulled out a lot of my best camera tricks to do this, but the key tool to doing any of this was setting up the correct key shots using time honored proportioning rules. This was aided by using the excellent Kozu MME overlay tool. Here’s the same shot without the Kozu overlay for comparison. There are tons of excellent MMEs available these days but I adopted a “KISS” strategy as the overall objective was “just to get the job done“. Key to this strategy was the use of Excellent Shadows. This was applied to everything except the sky-dome and Bismarck. Serious Shader was applied to the sky-dome to help saturate its colors slightly. The sky-dome’s colors are key to the effects applied to Bismarck which was BeamMan’s Multiple Light Source which incidentally, works complementary with the Excellent Shadow effect. BeamMan’s PowerDOF, which was adjusted down and bound to Bismarck is crucial to the camera strategy used. Specifically, there is only enough visual information with regards to the background to establish “time and place” and give an overall dreamy/surreal quality to the production. Notice that neither Bismarck nor her Pz IV are ever affected by the effect; they always remain sharp regardless of the focal length value of the camera set up ( which varied drastically to achieve the visual effects I wanted ). o_BleachByPass was used to increase sharpness and deepen color saturation by increasing the contrast. Used at partial strength. Diffusion 7 was used to soften the overall scene slightly and reduce some of the residual caused by the effect above. Used at partial strength. Cheap Lens was used to frame the scenes. o_psSepia was used only at the beginning to create the vintage photo impression at the beginning of the video. This was faded out and then turned off. It really helps to establish the right “mood“, but continual use in this application was undesirable. Note: To fade an effect just change its Tr value from the desired Max value (usually “1.0”) to “0” over a series of frames. Then turn it off completely by unchecking its display property box. Remember to register the changes! The lighting was set up to raise the illumination level back to a normal level as the overlay shaders tend to darken the overall scene. Finally, the light angle was set up so as to exploit the full effectiveness of the shadow play on the primary models. The way the shadow cast by Bismarck’s peak cap on her face, really makes a great difference in helping her performance by helping emphasize the visual meanings of what she is singing. The shadow play on the tank itself helps to define it’s form and create a sense of menace. 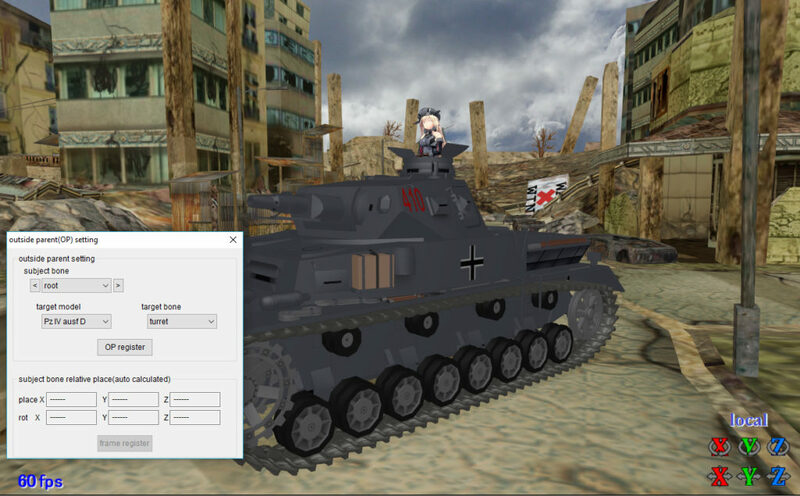 The Diffusion effect also help to make the Pz IV look less “blocky” and toy like. I tried BeamMan’s Mechanical Shader on it, but wherein it looked really neat, it became too dark, plus the requisite PostPointLights made things complicated for a working camera that keeps changing at a rapid pace. The MME PowerDOF, properly specified and bound to Bismarck does amazing work focusing attention on Bismarck by effectively eliminating distracting background details. The performance was recorded raw and then further worked using the NCH Video Editor. Mainly this was used to add the title and to create the final production version which was then uploaded to YouTube. How long did this all take? Three to four evenings; about 6 hours per stretch. The key lesson here for anyone is that, with only a little imagination and some work, you can easily tweak an existing “canned” motion and make it something uniquely your own. This can be a lot of fun as well as a personal challenge, but well worth the effort if you really want to make something special, without doing everything from scratch. Effects (sorry, but please find your own links using GOOGLE) – mentioned above and as listed on the video page. Start here if you can’t GOOGLE. Miku Hatsune © Crypton Future Media Inc.